Shoot sharper, more detailed photos on the 13 MP auto-focus rear camera with automatic scene detection and led flash let you capture crisp photos whether you’re out and about or indoors. Include all of your best friends in your group selfie, thanks to the 8 MP front camera with a wide 84.6-degree field of view. Enjoy the perfect screen ratio on the 5.2’’ HD+ IPS LCD capacitive touchscreen display for compact device with maximized screen space. The 18:9 ratio in the new Nokia 3 is perfect for getting the most out of its display whether you’re watching films or feeds – no more missed screen space. Running on a powerful Octa-Core processor, the new Nokia 3 lets you experience more, whether you’re playing AR games or multitasking between apps. You’ll also enjoy secure access to useful apps like Google Pay. Enjoy 32GB or 16GB of expandable memory (MicroSD card support up to 128 GB) and 2/3GB RAM for a full and speedy experience. 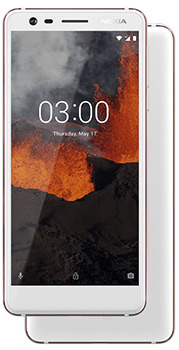 With a premium design, the Nokia 3.1 draws attention with its subtle curves and striking diamond-cut aluminium sides. And with its curved back and sculpted Corning® Gorilla® Glass display, the new Nokia 3 nestles comfortably in your hand. Android One brings a Google designed software experience to the new Nokia 3 with a streamlined, easy to use interface and a curated set of pre-installed apps, and free, unlimited high quality photos storage.